So we make the trip to Weston Super-Mare on Saturday afternoon as we return to National league South action, despite the ‘Seagulls’ current league position, they’re no easy opponent after securing their spot in the Emirates FA cup 1st round after beating neighbours Bath 1-0 at the Woodspring Stadium. Ahead of the game we wanted to get to know a little more about how our opposition fans think the game will pan out, normally we take the time to interview the opposition fan but this time we’re talking to part of the WSM Media team, Liam Drury who’s often behind your match reports and previews of the matches. So Liam, what are you predicting for Saturday’s game? After last Saturday’s win over Bath, I think it could possibly be the turning point in our season but Concord’s a tough game and they’ll come to us hungry for three points again. But, I’m going to go for a 1 – 1 draw. Liam, what have you made of Weston’s start to the season? It’s not been the best start. There have been times where we’ve gone ahead and then made one or two defensive errors which have costed us three points. We need to get the first league win ASAP now. Performances have been there in some games, but performances don’t mean anything if you don’t get the right result. 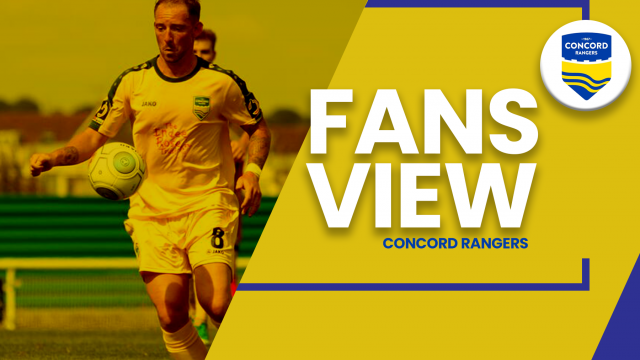 What’s been your thoughts of Concord Rangers this season as a club whether that be on or off the field? I’ve been impressed with Concord off the field, their marketing and media strategy seems to have helped get people through the turnstiles, because when we visited Concord last season, the attendance was pretty much abysmal. You could count how many people were within the ground! I can’t say too much about how good Concord are on the pitch, but they look to have made a steady start under their new management team and new squad. And who’s the key man to keep an eye on at the game? I would say Jarrad Welch. He’s not scored since August, but he’s put in good performances all season and he knows how to score from outside the box. He’s not quick, but he’s good with the ball at his feet, got good vision and can take a man on. Lethal right peg, and he’s not too bad on the left either! Liam, weston have made some good progression off the field so far this season, what’s that been like to play a part in? Yeah, it’s been really enjoyable to be a part of! My role’s changed slightly from last season, and it’s fun travelling to all these different grounds every other Saturday. I’d go as far as seeing our media and marketing is probably one of the top three in the league, alongside Billericay and yourselves! Finally, what’s your predicting starting 11?